The CD161 antigen is also designated as the NKR-P1A molecule. CD161 is a type II integral membrane protein expressed as a monomer of 44 kDa or as a disulphide-linked homodimer of 80 kDa. The carboxy-terminal extracellular domain is homologous to Ca++-dependent (C-type) lectin superfamily. CD161 is an activatory NK receptor, but in contrast with other NK receptors such as KIR (p58, p70, p140) and CD94/NKG2, CD161-mediated activation is not HLA-dependent. 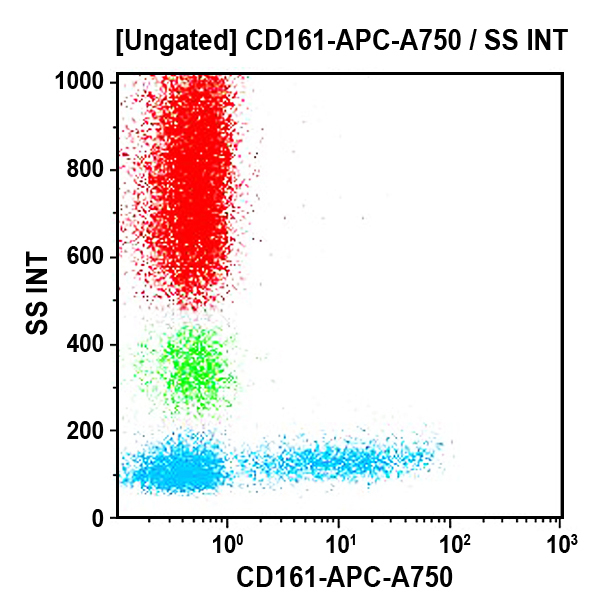 CD161 is expressed on all NK cells and on sub-populations of T lymphocytes. *Alexa Fluor and Pacific Blue are registered trademarks of Molecular Probes, Inc.